The Wedding of Andri & Ria at The Royal Santrian, Bali. Different cultures have their own wedding traditions. Most of the attention is given on the marriage ceremony because many people tend to overlook other rituals which are as important as the wedding day. The betrothal is a big pre-wedding ceremony. In the Chinese tradition, the rite is different depending on the tribe. In Indonesia, the tradition between ethnic groups has become mixed. In the Hokkien dialect, the betrothal rite is known as sang jit-thau or its abbreviated form sang jit. The betrothal gifts are very unique as it includes pig trotters and rice candies. Household items are also given to the bride, symbolic of the duties she will assume as a wife. During the eve of the wedding ceremony, Hokkien families pay respects to the Jade Emperor, called Thi-kong (Lord of Heaven), to seek his protection. Andry and Ria chose the decoration of their sang jit with the chinoiserie theme so there’s a lot of blue and white Chinese vases and Chinese-style furniture. “Double Happiness” in Chinese character, which is often associated with weddings, becomes the background centerpiece in red roses. A table made of redwood emphasizes the ethnic look. 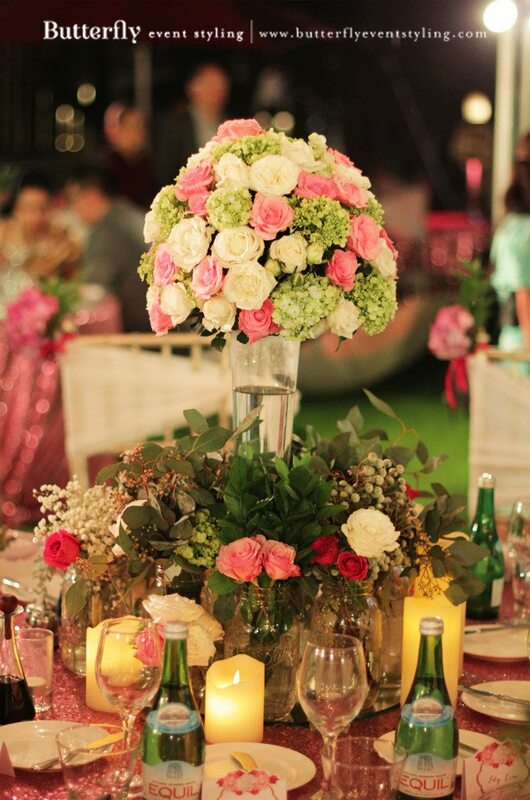 Meanwhile, their wedding reception is rustic romantic at The Royal Santrian in Bali. The bride and groom like a mixture of pink, white, and peach. There are many different types of flowers in this wedding in the arches, bouquets, and centerpieces such as roses, baby’s breath, peonies, brunia, and carnations. The wedding took place outdoors so we installed hanging lights. The couple was able to say “I do” above the water of the swimming pool which overlooks the beach. It was romantic indeed. We lit up the entrance with blue light to brighten the path at night. Overall the betrothal ceremony and the wedding look pretty and romantic with a homage to the Chinese heritage. This entry was posted in Celebrating Life, Color & Moodboards, Inspirations & Ideas, Others, Weddings and tagged Bali, Decoration, Decoration Bali, Decoration Idea, Decoration Inspiration, Decoration Jakarta, Decorator, Flower Trends, Flowers, Fresh Flowers, Ideas, Indoor, Indoor Decoration, Indoor Party, Indoor Venue, Inspiration, Jakarta, Outdoor, Outdoor Decoration, Outdoor Party, Outdoor Venue, Party Decoration, Real Wedding, Trend, Venue, Wedding, Wedding Bali, Wedding Decoration, Wedding Decoration Bali, Wedding Decoration Idea, Wedding Decoration Jakarta, Wedding Decorator, Wedding Decorator Jakarta, Wedding Inspiration, Wedding Jakarta, Wedding Trend, Wedding Trends 2016. Bookmark the permalink.